The FT-450D is a compact yet superb HF/50MHz radio with state-of-the-art IF DSP technology configured to provide World Class performance in an easy to operate package. 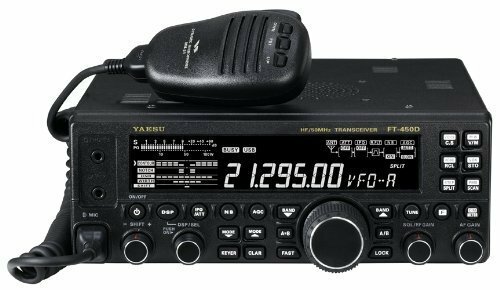 New licensees, casual operators, DX chasers, contesters, portable / field enthusiasts, and emergency service providers…This Radio is for YOU ! The current “FT 450D” model includes some great features not offered with the original FT 450 and FT 450AT models that have been discontinued. Illuminated Key Buttons 300Hz / 500Hz / 2.4 kHz CW IF Filter Front Feet Stand * Classically Designed Main Dial * and Knobs Dynamic Microphone MH-31A8J IncludedFM-USB-LSB-AM-CW, 100 Watts of Transmit output on 6-160M Amateur Radio. Receives 30Khz to 54Mhz continious including All Shortwave & AM broadcast. Built-In Automatic Antenna tuner, ctcss, 500 & 300 Hz CW Filters. Fast 400 MHz IF DSP (Digital Signal Processing) technology.